If small-unarmed drone aircraft can be deployed by law enforcement in dangerous armed barricade situations, why is the US Department of Justice not providing this technology to US law enforcement, if it has the possibility to protect our law enforcement officers? The US military Special Force units are testing small drone aircraft to provide operational awareness to troops in combat zones. Why is this technology not available and being field tested domestically if it has the potential to save lives, and give law enforcement officers immediate intelligence for better decision-making without placing our officers in harm’s way in dangerous situations? Several jurisdictions have experimented with drone aircraft to provide better services and protection to the community. Privacy concerns and ethical considerations need to be discussed and policies with best practices can be established so that the drone technology is not abused and is transparent to the public. Drone technology has an opportunity to provide a level of security to citizens and provide our first responders and criminal justice agencies with a tool that provides instant situational intelligence information to on scene commanders to make decisions based on current information provided by the drone’s ability to display what is happening in real time. 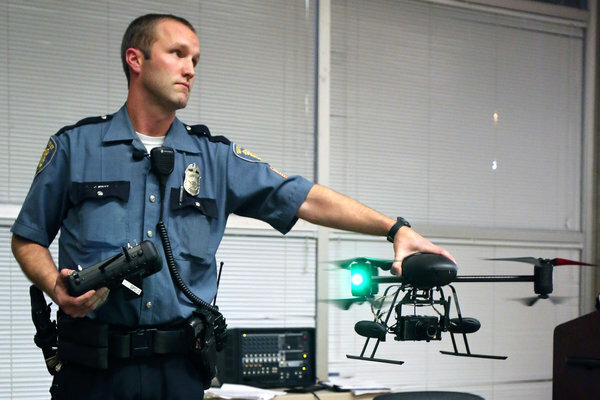 Can drones be used effectively by law enforcement agencies? Posted in Mark's Articles and tagged #BlueLivesMatter, Criminal Justice, Criminology, Drones, Police, Sheriff. Bookmark the permalink. Reblogged this on PUBLIC SAFETY DISPATCH.